Bruno Mars is gearing up for a very big December. He kicked things off by serenading beautiful models at the Victoria Secret's Fashion show and is getting ready for the release of his highly anticipated sophomore album,Unorthodox Jukebox, on December 11. So what will Mars be doing to celebrate his big release? Spending it with MTV. Mars will sit down with MTV's Sway Calloway to talk all about his latest effort and perform his new single, "Young Girls," during Viacom's12/12/12 celebration. Mars will be featured during the eight-hour live stream entitled "The Big & Best of 2012: A Year End Celebration Presented by T-Mobile." MTV News recently caught up with Mars on the set of his Paper Magazine December/January cover and it was there he revealed his thought process, or lack thereof, behind releasing "Young Girls" as the second single off his album. "I felt 'Young Girls' was good," Mars said. " 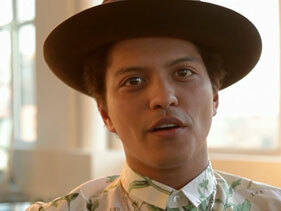 'Locked Out of Heaven' was something brand new I tried in the studio and it felt like the right thing to do. None of these things are planned, which one goes first, which one goes second. One day I wake up and I say, 'You know what? I want the world to hear this song that I wrote called "Young Girls," ' and I put it out." Mars, who said he plans on going on tour next year, admits that he has been spending a lot of time thinking about is the video treatment for "Young Girls." "Every day I'm thinking about the video," Mars said. "Its' going to be something I've never done before, I promise you that." Mars, who described his album as "darker" and "more aggressive" than his 2010 debut album Doo-Wops & Hooligans, gained attention by not only experimenting with different sounds, but also with a very eye-catching album cover. "On the album Unorthodox Jukebox there's a gorilla on the album cover because I wrote a song called 'Gorilla,' " Mars said. "And that was the first song we wrote for this album and it really set the tone for the entire project and it kind of became the mascot. Why not put it on the cover?" The live stream will also include the final showdown in MTV's "Last Fans Standing" competition, pitting the fan armies of 16 of today's biggest stars, from Rihanna to Katy Perry, Lady Gaga, Taylor Swift, One Direction, the Wanted, Nicki Minaj and Justin Bieber against one another in a duel for the crown of Best Fans of the Year. Voting is under way onMTV's Facebook page now, so be sure to help rack up points for your army before this round ends on December 12. Hosted by MTV News' Sway Calloway, VH1's Carrie Keagan and CMT's Kourtney Hansen, "The Big & Best of 2012" will be broadcast live from MTV's legendary Times Square studio and on location in music venues in New York City, Boston and Nashville.